Which Tonearm is prepared or available for balanced / symmetrical operation? We believe that, apart from Rega-tonearms and derivates, all arms have floating internal wiring, and are ready for balanced connection. Wilson Benesch Ltd. UK A.C.T. 0.5 A.C.T. 2 C. M. yes ? Model 2.2+2.1 B. Graham yes ? Kuzma Ltd. Slovakia all models F. Kuzma yes ? Frank Schroeder Germany all models F. Schröder yes ? Acoustic Solid Germany WTB 213 Wirth yes ? G.F.C. Hadcock UK all models Dr. H. Unsworth yes ? Cantus Sweden Opus3 Cantus Bo Hansson yes ? Eminent Technology USA ET-2, ET-2.5 B. Thigpen yes ? AQVOX tries to build a complete list, if you know some more details, let us know. This helps us to complete the list. We believe that, apart from Rega and derivates, all modern arms have floating internal wiring. That means, the Signal-Ground wires are not connected to each other or not to the turntable or tonearm or to the chassis ground-cable. If your arm is not listed please contact us or your dealer/manufacturer. 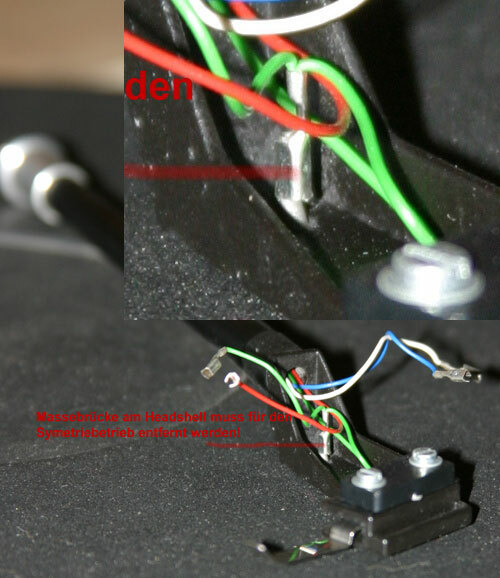 *only for REGA: the tonearm internal ground wire has to be disconnected from the signal ground. If not done, humm, radio or disturbances -MAY- be audible in balanced input operation. All REGA arms with separate ground-wire can be used without modification. For easy modifications please ask your dealer or us. AQVOX offers special Cables for this, because a Phonostage with balanced current-amplification needs for optimum sound true balanced cables with braided- or twisted conductors. A peace of isolation tape will isolate the connector from the toneam metall.